Industrial tanks, vessels and silos are used to store a variety of materials including chemicals, food products, concrete, oils, glue, ink, wastewater, etc. Buildup of residue on the interior can contaminate the product and even halt production. Champion has the experience, equipment, and expertise to satisfy your specific cleaning needs while managing the safe handling and disposal of wastes. The type of product and amount of use determines how we perform the project and the frequency of cleaning. Cleaning can be performed by pressure washing, manually cleaning, hydroblasting, scraping, vacuuming and chemically cleaning. 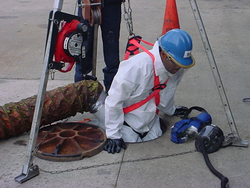 Confined Space Equipment - Full Body Harnesses, Lifeline Tripods and Retrieval Benches are Standard Equipment used by Champion Employees along with established Emergency Procedures.